Bayonetta Part #4 - Lavarous? 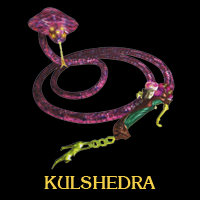 A possessed whip, sealing away the soul of the ancient serpentine demon Kulshedra. Summoning the power of the demon from a portal on the weapon's hilt, it can be used in the same way as a normal whip. yoshesque: Good for grabbing enemies and following through by switching to a different weapon. Can also use it to swing enemies around and has good range. Most people probably only use it for 'Stay in the Air' Alfheims though. 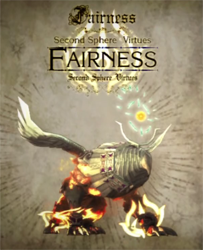 A Virtue charged with the administration of miracles, it is wrapped in flames when appearing in the physical world, a power emblematic of its courage. A torrent of flame blazing as bright as the sun, these flames become the light that burns away darkness from those who receive the graces of Fairness. However, for those out of the angel's good graces, they are the fire and brimstone of destruction. 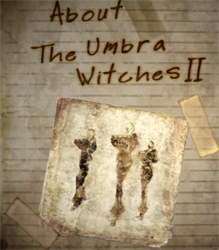 Umbra Witches - controllers of the dark power. The ways of their discipline were actually quite varied - breathing, movement, medicine, and tactics were joined in the Middle Ages by training in the operation of heavy weapons, culminating in a curriculum whose total breadth and intensity are hard to ascertain. This training forged both the body and the soul, honing each witch into a vessel capable of withstanding the rigours of the magical arts, and allowing one to begin to interact with other dwellers of the magical realm. This interaction with the world of spirits lies at the very core of magic. To put these "dwellers of the magical realm" into layman's terms, they most closely fit the common conception of demons. Developing demon-like powers... It seems this was one of the reasons these women were burdened with a sad fate, always living in history's shadows. I have been able to gain no further solid information regarding the magical arts. As the witch clan has long since been annihilated, and their memory forgotten, the residents of this town detest them with all their hearts... To allude to their existence is quite the taboo. Yet, the key to unlocking the witch's mysteries still remains. In Vigrid, the man held up by many to be a paragon of the faith continues to see out any remaining witches. Are the witches, once thought to be wiped from the earth, still among us? If they are, how have they survived this long? What do they now know? And where on Earth could they be hiding? 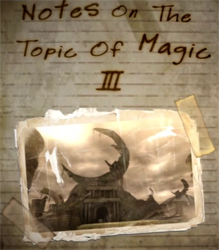 Finally, I have obtained scraps of a document that appears to lay out another elementary principle of the magical arts. I am unable to decipher the writing on the document, but it seems to describe a martial arts technique known as Dodge Offset. I pray it will be of use to someone, so I have included it within these notes. The magical arts of the Umbra. Their true significance is best understood in the context of how the Umbra were able to use this magic: via direct contact with demons in Inferno. It is thought that these witches underwent strict training in order to master the various techniques; however, the truth is coloured by the fact that the witches left people awe-struck, and were greatly revered. The true root of their power was none other than their ability to take unbelievably strong demon energy and bend it to their will, using it freely. The witches' direct contact saw them reaching into the heart of Inferno's darkness and summoning the beasts that swell there, drawing out their incredible magic and destructive powers. The witches under contract with these demons were able to exercise powers far beyond any that could be obtained by mere mortals, to the extent that some may even term these powers as aggressive, or brutal. It was thanks to these powers that the witches boasted such awesome force in battle. From the Vigridian religious perspective, those living in the human world find interaction with other realms to be incredibly difficult. Residents of Inferno also find it impossible to manifest themselves in the human world. This is why witches require some sort of catalyst to summon demons into the human world, channelling the spirit via this medium. This catalyst most often used by witches was their hair. It is well accepted that hair had many uses in the magical arts, and the witches called this use of their own hair the Wicked Weave. It was said to have been used not just to summon demons, but also to summon magical items, as well as forming the witches' uniforms. I would also like to touch briefly on the despair these women must have felt. To gain the incredible power afforded to them, they were forced to trade their souls to the demons of Inferno. Within the Trinity of Realities, it is believed that the deceased find their souls sent to heaven in an endless cycle of birth, death, and rebirth. However, witches were met with only a single possible fate - death - followed by endless torment in Inferno. Once one had set foot upon the path of the magical arts, their [sic] lay nothing but the harsh reality that there is no turning back. Despite this fact, it was a path desired by a never-ending stream of believers. How these women captured so many hearts, minds and imaginations remains unknown. In Vigrid's long, protracted history, there was once an enormous coliseum built facing the sea. It remains today, largely intact. According to record, the coliseum was used not for martial contests or other games, but as an altar for the worship of one of the era's gods, a being known as Fortitudo. Even today, as the urban functions of the city move to Isla del Sol, the coliseum holds a special place in the religious beliefs of those who worship the Laguna. 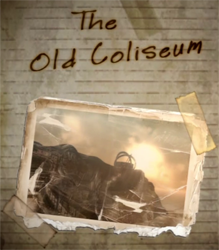 Even though the winds of time have long since destroyed the road leading to the structure, forcing a treacherous passage through the cliffs, the stream of those making a pilgrimage to the coliseum is endless.